For the truly faithful, no miracle is necessary. 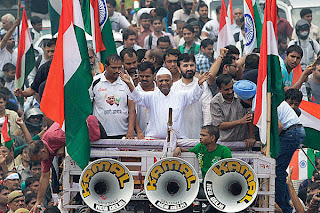 This is Anna Hazare for you: a fearless strong man! Let us all pray for his health and long life. 8 days have passed without food, but his spirit is still strong: he is indeed a true hero. Here is one man who has galvanised the entire nation to stand up and say a big No to corruption. "The woods are lovely, dark, and deep, But I have promises to keep, And miles to go before I sleep, And miles to go before I sleep. ...".He has a great job to accomplish and hurdles to overcome with vested interests working overtime to blunt his mission. 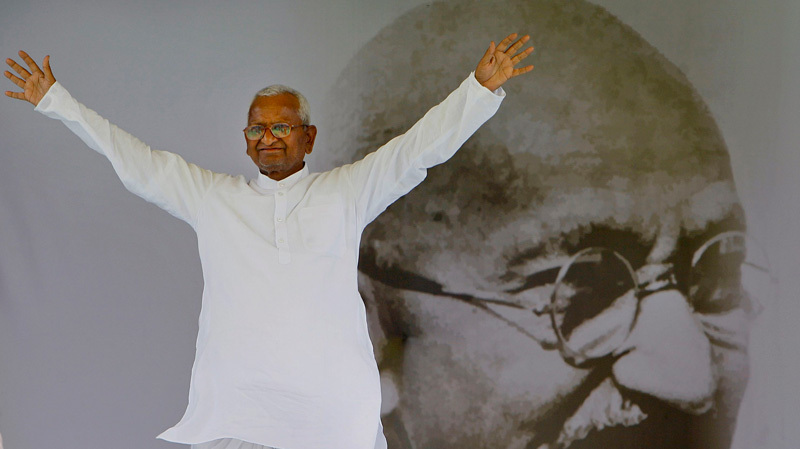 Join I am AnnA campaign! We(group of professionals) observed fast on 21st August to support the cause! Believe me, that is the first time in my life that I observed fast without drinking a drop of water for 24 hrs! Mark my words, AnnA will be regarded as new age Mahatma! We fully support him. More and more people shall come out in his support. It is time to come together and clean up the house. Politicians will resist but Anna will keep going. I agree with you, he is the real hero! We are all with him! India needs this new age 'Gandhian'. This man really has got strong will power who works without any self interest, may God bless him....now its for us to act with honesty in our personal life when it comes to our personal causes. I wholeheartedly support him .My prayers for his good health and long life . What is more surprising is the anna uprising has aroused a lot of little warriors. undoubtedly this is a defining revolution. I wholeheartedly support him and wish and pray for his good health. 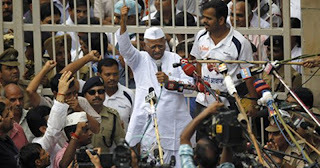 The smile on his tired face told a lot about his grit..I agree with Irfanuddin..if we are with Anna, it is up to us not to pay any bribe in our day to day life right from securing a death certificate to anything else. From the massive support that he is getting, one can gauge how fed up the Indian people are of corruption. I wonder why the Govt is not reading the writing on the wall. Its a just a matter of time. I am praying for him. He has taught me the value of self sacrifice and that change begins with me. I am already doing things that he speaks about. Thank you Anna! I hope that you have a long life. may anna live long..He is looking so fragile these days but his spirits aren't fragile at all!Really appreciate him.I cannot even stay one day without food frankly . What a lovely thing he is doing and India needs such people to be cleansed from inside. If he is against corruption then I cheer him along with a mighty cheer!!!! It is not an easy battle he has thrown himself into- but it is definitely the RIGHT one.